- Publisher For more than ten years, The Christian Bed & Breakfast Directory has pointed travelers to some of the most hospitable, quaint, unique, and memorable places to stay in the United States, Canada, and the Caribbean. Now back for another year, the 2003-2004 edition includes information on more than twelve hundred inns-including telephone numbers, web site details, and E-mail addresses. Featuring complete details on accommodations, rates, credit card policies, nearby attractions, and more, The Christian Bed & Breakfast Directory is an indespensable tool for anyone planning a relaxing getaway-across town or across the country. 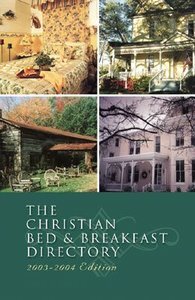 About "The Christian Bed & Breakfast Directory (2003 Ed)"
For more than ten years, The Christian Bed & Breakfast Directory has pointed travelers to some of the most hospitable, quaint, unique, and memorable places to stay in the United States, Canada, and the Caribbean. Now back for another year, the 2003-2004 edition includes information on more than twelve hundred inns-including telephone numbers, web site details, and E-mail addresses. Featuring complete details on accommodations, rates, credit card policies, nearby attractions, and more, The Christian Bed & Breakfast Directory is an indespensable tool for anyone planning a relaxing getaway-across town or across the country.